Includes detailed coverage of wireless channel sounding, modelling, characterization and model validation. Provides state-of-the-art research results on space-time coding, including comprehensive tutorial coverage of orthogonal space-time block codes. Discusses important recent developments in spatial multiplexing, transmit beam-forming, pre-coding and joint transceiver design for the multi-user MIMO downlink using full or partial CSI. Illustrates all theory with numerous examples gleaned from cutting-edge research from around the globe. Since 2002, Professor Alex Gershman has worked in the Dept of Electrical & Computer Engineering at McMaster University in Canada but is currently on research leave as a Guest Professor and Head of the Smart Antenna Research team (SmART) at the Dept of Communication Systems, University of Duisburg-Essen, Germany. With 20 years experience in the field gained in Russia, Switzerland, Germany and Canada, Professor Gershman has participated in numerous technical committees and has been an invited speaker at more than 20 events. He is a Senior Member of the IEEE and since 1999 has been the Associate Editor of IEEE Transactions on Signal Processing. Professor Nikos Sidiropoulos currently works in both the Telecommunications Division, Dept of Electronic & Computer Engineering, University of Crete, Greece and as an Adjunct Professor at the Dept of Electrical & Computer Engineering & Digital Technology Center, University of Minnesota, USA. After completing his Diploma in Electrical Engineering in Greece he obtained his M.S. and Ph.D. in Electrical Engineering from the University of Maryland, USA. With 15 years experience in the area he has industry experience from G-Systems Ltd, Athens and as a consultant for Globespan Inc. USA. 1 MIMO Wireless Channel Modeling and Experimental Characterization (Michael A. Jensen and Jon W. Wallace). 1.4 The Impact of Antennas on MIMO Performance. 2 Multidimensional Harmonic Retrieval with Applications in MIMO Wireless Channel Sounding (Xiangqian Liu, Nikos D. Sidiropoulos, and Tao Jiang). 2.2 Harmonic Retrieval Data Model. 2.3 Identifiability of Multidimensional Harmonic Retrieval. 2.4 Multidimensional Harmonic Retrieval Algorithms. 2.6 Multidimensional Harmonic Retrieval for MIMO Channel Estimation. 3 Certain Computations Involving Complex Gaussian Matrices with Applications to the Performance Analysis of MIMO Systems (Ming Kang, Lin Yang, and Mohamed-Slim Alouini). 3.2 Performance Measures of Multiple Antenna Systems. 3.4 General Calculations with MIMO Applications. 4 Recent Advances in Orthogonal Space-Time Block Coding (Mohammad Gharavi-Alkhansari, Alex B. Gershman, and Shahram Shahbazpanahi). 4.5 Constellation Space Invariance and Equivalent Array-Processing-Type MIMO Model. 4.7 Exact Symbol Error Probability Analysis of Coherent ML Decoder. 4.8 Optimality Properties of OSTBCs. 4.9 Blind Decoding of OSTBCs. 4.10 Multiaccess MIMO Receivers for OSTBCs. 5 Trace-Orthogonal Full Diversity Cyclotomic Space-Time Codes (Jian-Kang Zhang, Jing Liu, and Kon Max Wong). 5.2 Channel Model with Linear Dispersion Codes. 5.3 Good Structures for LD Codes: Trace Orthogonality. 5.5 Construction of Trace Orthogonal LD Codes. 5.6 Design of Full Diversity LD Codes. 5.7 Design of Full Diversity Linear Space-time Block Codes for N .
5.8 Design Examples and Simulations. 6 Linear and Dirty-Paper Techniques for the Multiuser MIMO Downlink (Christian B. Peel, Quentin H. Spencer, A. Lee Swindlehurst, Martin Haardt, and Bertrand M. Hochwald). 7 Antenna Subset Selection in MIMO Communication Systems (Alexei Gorokhov, Dhananjay A. Gore, and Arogyaswami J. Paulraj). 7.4 Diversity and Multiplexing with MIMO Antenna Selection. 7.5 Receive Antenna Selection Algorithms. 7.6 Antenna Selection in MIMO Wireless LAN Systems. 8 Convex Optimization Theory Applied to Joint Transmitter-Receiver Design in MIMO Channels (Daniel P´erez Palomar, Antonio Pascual-Iserte, John M. Cioffi, and Miguel Angel Lagunas). 8.4 Beamforming Design for MIMO Channels: A Convex Optimization Approach. 8.5 An Application to Robust Transmitter Design in MIMO Channels. 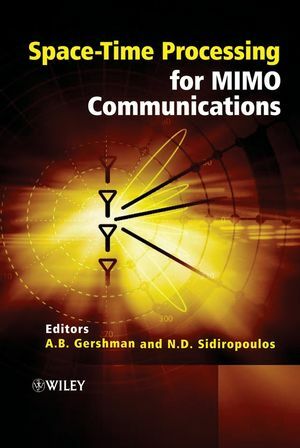 9 MIMO Communications with Partial Channel State Information (Shengli Zhou and Georgios B. Giannakis). 9.4 Error Performance Oriented Designs. 9.5 Adaptive Modulation with Partial CSI.